Iran's Green Movement: A digital activist describes his work's psychological toll. This blog post originally appeared on Global Voices Advocacy. Iran’s Green Movement began in 2009 when citizen groups accused government officials of altering outcomes in national elections. Citizens and activists gathered in the streets to protest and also relied on social networks such as Twitter to disseminate their message and coordinate action. When the government sought to control media reports of what was happening inside the country, activists used tools for circumventing blocked websites and sharing content for broader distribution to the world, often with help from supporters in other parts of the world. This marked one of the first large-scale movements where new media served as a platform for coordination and communication between activists and played a vital role in showing the world what was happening on the ground. The following narrative comes from Cameran Ashraf, an Iranian-American citizen living in the United States who helped facilitate communication and information exchange for activists and protesters during this period. The news in June 2009 that thousands of Iranians were filling the streets and risking their lives to have their voices heard propelled me to the computer in the United States. For the first time in my life I had a chance to be deeply involved with something greater than myself. I can remember my heart telling me this was going to be a life-altering experience and that things would never be the same. I was right, but I didn’t know what that would mean. 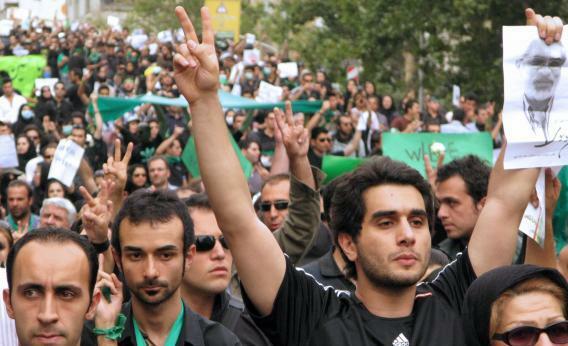 In 2009-2011, I played a pivotal role on the Internet side of the Iranian Green Movement. This brought me many opportunities, such as co-founding AccessNow, media attention (including from the Iranian government), and deep connections with like-minded individuals. It helped me frame my passions and desire to do good in the world, to understand a lot about who I was and how I saw the world. It was also psychologically devastating and something I am still coming to grips with. There are different kinds of digital activists. Some focus on Twitter or spreading information. Others mobilize support on Facebook. A few make posters, motivational videos, or leverage other talents. Some, and I include myself in this class, provide direct technological support to movements and activists in-country. Our team provided secured hosting to dozens of key websites and supported key reporters and activists in-country, and I facilitated more than 3 million video downloads from inside Iran, among other activities. I was on call 24 hours a day from 2009-2011 and can only rarely recall getting more than four hours of sleep a night. If it sounds as if I am bragging or inflating myself, I am not—this is part of the healing process and part of coming to terms with feelings of not doing enough, not helping enough, and not being enough. There is something to geographically distant material engagement that pushes one’s feelings to the margins, to the point where your body lives on the time in another land and the only thing motivating you is the pureness of help itself. While much is made of digital activism and the ability afforded us by the Internet to help, little is made of its costs on those who do help. Because of one’s extreme virtual proximity, intense feelings of inadequacy and of “not doing enough” emerge. You’re doing what you can, to the detriment of your own health—the people you support and whose digital security depends on you are there facing all of the risks you experience by proxy. You recognize the seriousness, yet at the same time the absurdity, as even mundane annoyances, such as being stuck in traffic, become extraordinary moments where you see what is “truly important” in the world. Constantly focusing on what is “truly important” means you often neglect the mundane side of what is “truly important”—your mental health, relationships with family and friends, and fun time to relax. The pleasure of normal conversations, the absurdities of daily life, the sun, stars, hugs, all slowly dissolve as you begin to live the crisis and realities of others thousands of miles away. Those anxieties become internalized and externalized in anger, irritation, lashing out—all of which I did. It is “the cause,” after all. That movement that will make the world right, which will correct the horrific injustices you were privy to on a daily basis. It will avenge the friends arrested, tortured, or killed. You live, breathe, eat, feel, touch anything related to it. The moments away from the computer are engaged in phone calls, texts, or in-person meetings and events. My body was in Los Angeles, but my mind was in Iran. Being so connected to something you are disconnected from is, I believe, deeply disturbing to your psyche. Sooner or later things make sense, and your mind realizes it’s been seeing and reading one thing and living another. At that moment it just happens—you “go dark.” Vanish. I didn’t tell anyone. I stopped replying to emails, texts, and phone calls. It was a complete breakdown from which I am still recovering. To this day I turn my cellphone face-down and keep it permanently on silent as I associate much trauma and bad news with it. I sat silent for a year, seeing a therapist but keeping everything inside. The few individuals I confided in could only distantly try to understand, in the sort of way we empathize with someone who has lost a loved one while we are still whole. Though I didn’t realize it at the time, a good friend and important activist told me four words which would slowly embed themselves within me: You did your part. That was it. You did your part. I kept repeating those words—you did your part—day and night. It was my own Green Movement—one that stood up for myself. It was right, but it was not an epiphany. It did not cure me or bring me closure. What it did was open up a door for me to see what I did and to realize that it was what I could do based on where I was. I had done my part. I had answered the question that I had asked myself in June 2009: What will you say if your children ask you what you did when Iranians came to the streets? I could answer this now, as if I hadn’t known all along: I did my part. I could remain engaged with digital activism, but in manageable ways which honor the causes I support as well as myself. Each digital activist involved with in-country activists will encounter the stresses differently. The trauma of crisis at a distance will speak to their psychology in a unique way with unique repercussions. This is a different yet still heroic side of digital activism, far removed and hidden from the ideals of privacy, security, democracy, and human rights. It is a personal heroism that only a few see and only one person feels. I have briefly shared my own story as a means to open a real dialogue on mental health and digital activism—something I wish I had done much sooner and which should be part of any activist toolkit and training. Each digital activist will ultimately have their own story, their own confession which allows them continue down the path to a sense of personal normalcy and wholeness. This is the start of mine.